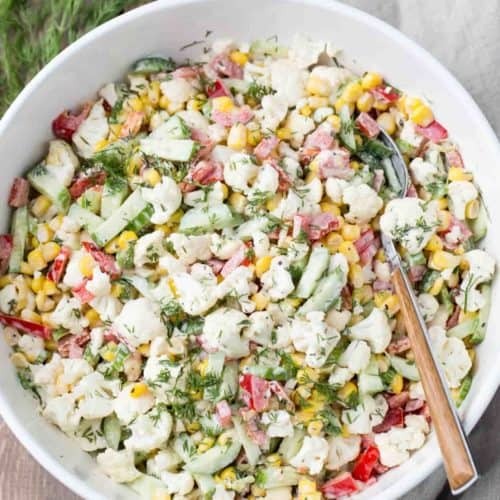 Cauliflower Cucumber Corn Salad Recipe. 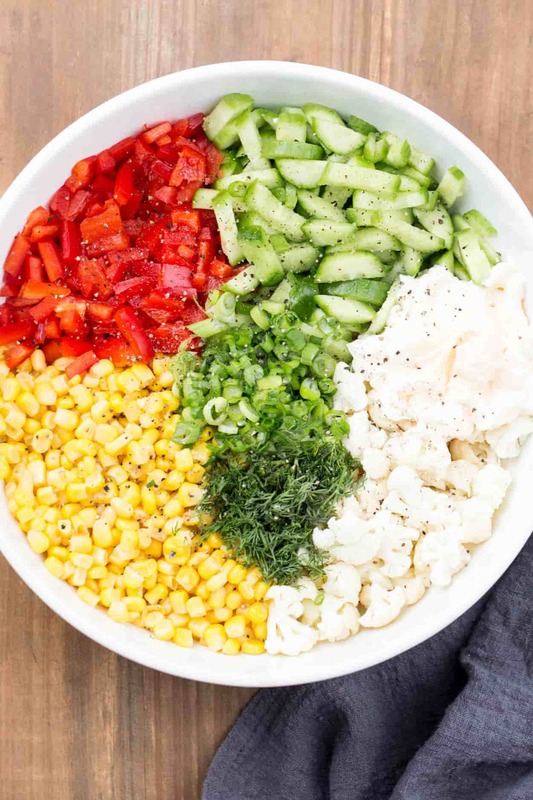 This easy salad is loaded with corn, cauliflower, cucumbers, peppers and dill with a mayo dressing is the perfect salad to enjoy all year long. This fresh, crispy and crunchy salad is truly wonderful. The cauliflower florets go so well with corn, cucumber and red pepper. It’s an unexpected combination that works! Since it doesn’t get soggy quickly, it’s great to serve at a potluck, brunch or party. Cut your cauliflower into small florets. Slice cucumber into thin slices. Thinly chop the green onions. Combine and mix all the ingredients. Can I Prepare the Corn Salad in Advance? Yes, this is a salad to prepared in advance. It can be made the previous day. Prepare all of the ingredients, keep covered and refrigerated. Before serving, mix and add dressing and season to taste. Keep leftover salad refrigerated. 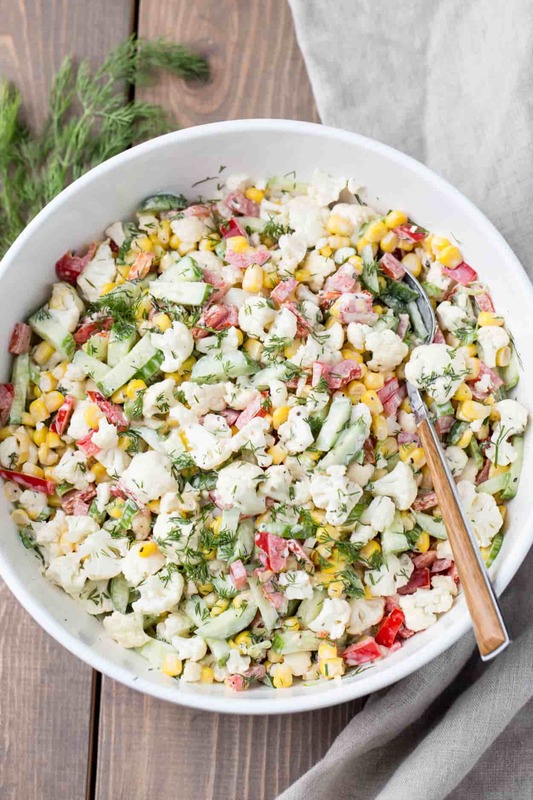 If you enjoyed this Cauliflower Cucumber Corn Salad, don’t forget to tag us on social media. We love to see your creations, #ValentinasCorner. Bacon Cauliflower Salad– If you like bacon, this one is for you. Cauliflower Salad Recipe– A family favorite. Crab Corn Egg Salad– Love the combination of crab with corn and egg. 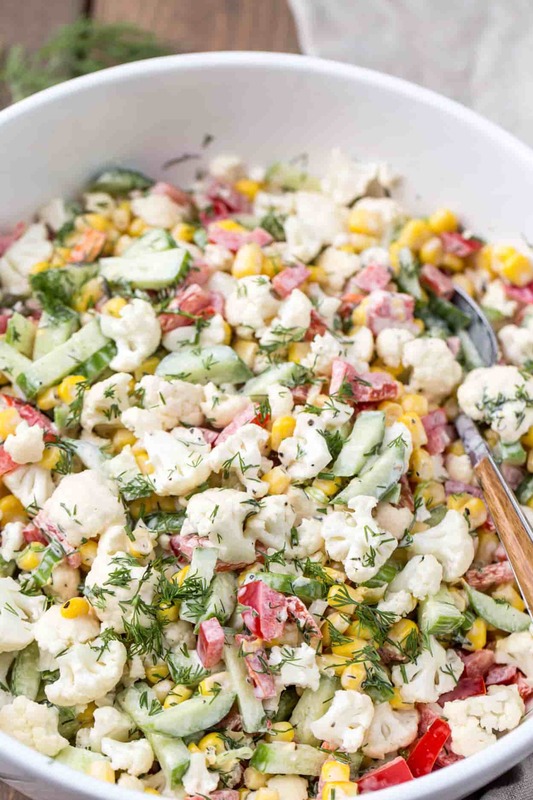 Cauliflower Corn and Cucumber Salad Recipe. An amazing and quick salad that can be prepared in advance. Cut your cauliflower into small florets. Slice cucumber into thin slices. Cube the red pepper. Thinly chop the green onions. Drain corn. Mix everything. Add mayo, salt and pepper to taste, mix well. Add dill, optional. This was a great recipe! My husband and I eat “light” one night a week and this was perfect. I did add a few things though – freshly grated cheddar cheese, slivered (because I couldn’t find my sliced) almonds, some ditalani noodles, and some chow mein noodles. It was great except next time I wouldn’t mix the chow mein noodles in ahead of time (I like them for the crunch factor). We also tried several dressings (light ranch, zesty Italian and poppyseed) besides the mayo. We put each on a corner of our plate, dipped our forks in and then went for the salad. That way we cut down on the amount of fat from the dressings. They were all great and husband called this a keeper!! I will be making this very often. Loved it!!! Thanks so much! This salad looks amazing! Love all the color! Hello, TY 4 this delightful recipe!! My hubby loved it!!! Sub’d mint for dill, used crumbled cauliflower, Mrs. Dash, light Caesar’s dressing, shredded cheddar, Parma cheese, bacon bits, pinch of slendar,,,as you can tell “a lil’ this & that” 2taste?? Thanks so much for your feedback, SherryYJ. Your version sounds fantastic, yummm. I had some cauliflower to use up and friends coming for dinner, so decided to try this. I used 3 ears fresh corn, cooked and cut off the cob. Rather than mayo and dill, I made a lemon basil vinaigrette dressing. Turned out great! Oh I love the fresh corn. You lemon basil vinaigrette dressing sounds heavenly, did you make it or purchase the dressing? I want! Thanks for trying our salad, Julie. Hello I want to bring this to camp.. Can I cut up all the ingredients and put them in the same bowl and then mix it with the Mayo there? Or should I keep all ingredients separate and then mix when we eat? Would the cucumbers make the cauliflower soggy? I’m makong this for camping too. Never even had it before but looks great. Pamela. Nope, you’ll be fine. 🙂 If you are really concerned, you can put your cucumbers in a separate container and then just combine at camp (or, just add a few pieces of paper towel under the cucumbers so it will soak in any liquid, discard before mixing). Enjoy your time at camp and enjoy this salad. You’ll love it. This salad is now officially one of my all-time favorites! Yum, I make this for every party and family gathering, and for simple family dinners during the week. It is absolutely delicious with my broiled salmon recipe, add some Jasmine rice and you have a perfect nutritious meal! Thanks so much for sharing this one!!! I loved your comment. Thanks for sharing, Marina. Now I’m intrigued about your broiled salmon recipe, do share. 🙂 And thanks so much for the feedback, it means a ton to me. I’m sorry I just saw your reply, I didn’t receive any sort of notification. Recipe is really simple. I cut up an entire salmon fillet into approximately 1.5″ slices and then sprinkle each one with lemon pepper seasoning, garlic powder, and a hint of salt. I rub the seasonings into each piece, making sure to get the sides. Then, I prepare the marinade… mix 2/3 cup each of soy sauce, water, and brown sugar, as well as 1/2 cup of oil. I pour the marinade into a glass baking dish and put in all the fish pieces skin side up into the marinade, cover with plastic wrap and refrigerate overnights. The next day, I place each piece of salmon separately into a little foil pouch and onto a baking pan. I discard the rest of the marinade. Bake at 425°F for approximately 15 minutes, then remove from the oven and take each piece out of the foil and onto a baking sheet, and put them all under the broiler for a few more minutes to brown. This is seriously the best recipe in the world for salmon, I haven’t met a single person who didn’t like it! Please do try it, I am sure even your kids will love it!!! Also, congratulations on your little bundle of joy! I am really happy for your guys, may God bless your family! And please let me know if you get a chance to try my salmon recipe, I’d love to hear your feedback! We made this last summer and we all loved it! I followed the recipe to a T was happy how quick, easy, and wonderful it was. With the fresh dill, I think I’ll compliment it with some lemon-garlic marinated salmon, grilled. Easy peasy and refreshing for a hot summer day. Thank you! What are the calories in this wonderful salad please! My husband does not like dill. I think I’ll try a little cilantro. We love this salad! A friend brought it to a potluck, and I asked (a little too desperately) if she would share the recipe! I was excited about it because my husband is a new kidney patient, and I was happy to find something new he can have! We just leave out the salt, and it’s a great fit for his Renal Diet! Thanks so much! Kim, I was on dialysis for 7 years. The renal diet can be hard. I sure wish the internet was as abundant with recipe sites when I first started my dialysis journey. Best wishes to your hubby. Thank you for this great recipe. I made it today to bring to a family Easter dinner. The only addition I made was to add some grated cheddar cheese. It was a real hit! I will be making this recipe again. And now I am going to check out your website for more recipes!!! I appreciate that so much, Anita! Thank you kindly. I used a mix of broccoli and cauliflower, lightly steamed. Then I added diced ham and gluten-free pasta (I used small macaroni) and it became a complete meal. Just don’t use spaghetti or similar, pasta needs to be small. That sounds wonderful, Mrs. G. That sounds like a tasty meal. Thanks for sharing. I whipped this up this afternoon exactly as written. IT’S A KEEPER! Love how colorful and crunchy it is. Will add to my summer menues. Thanks! Thank you, Pat. I agree, the salad is so easy to throw together and it’s such a wonderful salad. Was just a typo, Barb. 🙂 Thank you for catching that, it’s fixed. Can’t wait to start making it but can I substitute the mayo with low fat greek yogurt ? I have not yet tried subbing for greek yogurt. However, I’ve had many positive reviews from those who have tried the recipe with yogurt. :) Sorry, that wasn’t helpful. you can even use a vegan sour cream made of cashews with this, yogurt/nut yogurt…i think a little squeeze of citrus would brighten and even different herbs if you wanted to change it up sometime. this recipe made my mouth water 😀 Mmmm! Yes, Sarita. The cauliflower is raw in this recipe. 🙂 Enjoy.. When you say mayo do you mean real mayo or miracle whip? Absolutely yummy! Just a few tweaks for my personal taste. I added a small, diced jicama. For the dressing, I added the zest and juice of a small lemon, about a T of prepared basil pesto, and about a T of prepared chunky garlic from a tube. A dash of Sriracha pepper, mixed the dressing and added to the veggies. This is most definitely a keeper recipe. All the better, because I used fresh veggies from a local farmer!! LOVE! Oh my, Yvonne. Sounds superb!!!. Agree, fresh veggies are the best. You’ve got me craving your version.?? 192 calories per serving. I added cayenne pepper too. Tasted great!